Obviously, each one of these has it's own merit(s), but I'm liking the red, blue, and green mostly (in no particular order). We'll have to see if these are powerful enough to see play in constructed - Heroic being a mechanic *might* help, but hard to say. Double strike is always strong, and Fabled Hero is definitely looking to have Auras thrown on him. Not sure if he's any better than Fiendslayer Paladin - but with the right mix of cards, I guess he could be. 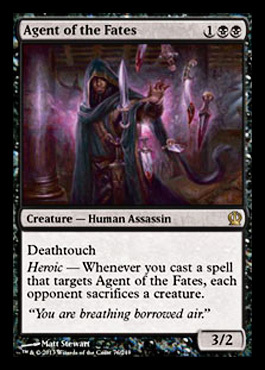 That said, Agent of the Fates looks awesome. 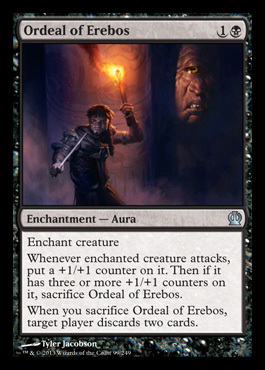 Any midrange or control shell seems like they could abuse his ability with little effort - even if he does happen to be the same CMC as another prime black creature, Lifebane Zombie. 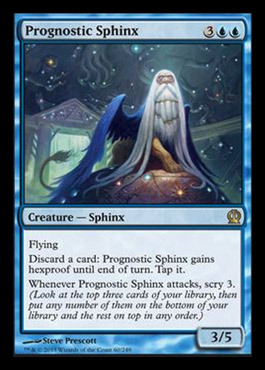 First, we have two fliers - this new Sphinx has some pretty powerful abilities, and I can imagine some blue mages (including myself) considering how to incorporate him into standard (post-rotation). The Chimera has the potential to be an extremely potent threat - although Scavenging Ooze does a good job at keeping him at bay. Focusing on the ground, Soldier of the Pantheon is a strict upgrade to Elite Vanguard, and will likely work it's way into white weenie strategies in constructed (especially since standard is losing Champion of the Parish). Nessian Courser was evidently the Future Sight card that Mark Rosewater had teased, which was quite disappointing - but, that sometimes happens with teasers. Last up for the day is Anger of the Gods - quite an amazing piece of art on an incredibly powerful card. And, just as we needed, another answer to Voice of Resurgence. Pillar of Flame, you will be missed.